While Portuguese is spoken in Europe and in Brazil they are different enough that you should use different resources depending on which version you want to learn. The accents are much thicker in Brazil than Europe and they can have different slang and ways of conducting everyday speech. Learning Portuguese doesn’t have to be dull. There are fun resources on the internet to learn either version of Portuguese. Here are some great resources for whichever dialect you want to learn or if you want to mix the two together if you want to try out different accents. For those who want to know how to learn Portuguese language online the most important thing to know is that you want to start out speaking this language and hearing it at the same time. Some people think you need to start out learning the grammar and vocabulary before you start speaking this language but that actually isn’t the case. Using flashcards is a great way to start studying Portuguese. You should also watch children’s shows in this language as they stick to simple words and sentences. Here are some online resources for those just starting out. italki is a website where you can connect with native Portuguese speakers. You should bookmark this site and start using it from day one. Start chatting with people on italki and develop some language exchange partners. Memrise is a very good resource of free European Portuguese courses. It has a number of common phrases for starting out. Duolingo is a free website that helps build your Portuguese grammar and vocabulary. italki also has lots of native speakers of Portuguese but from Brazil rather than Europe. Semantica is broken up into episodic video courses. Each one has one scene from a story it goes over in length. 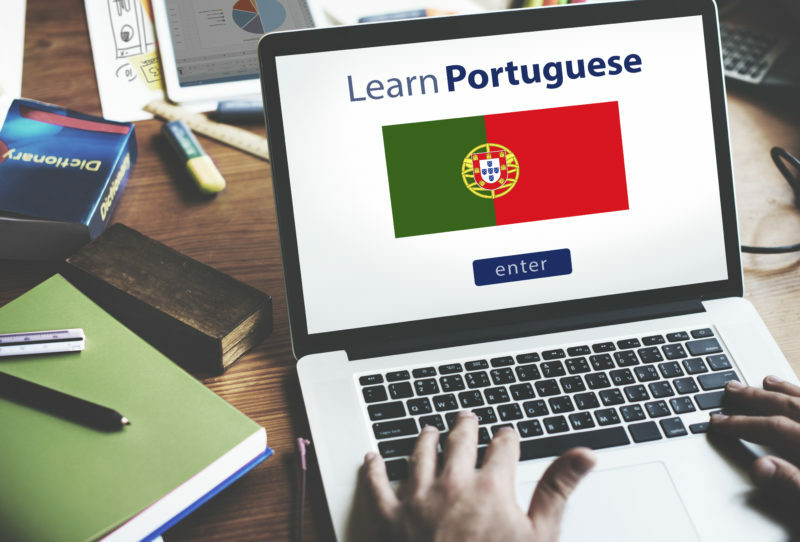 All of these websites take your Portuguese skills to the next level. These are all engaging websites that are fun to use. When you start out there will be a lot you don’t understand but if you stick to it you’ll quickly build your vocabulary. Portuguêses no Mundo is a free podcast that covers world travel. Each video has the same format and they are very engaging to watch and listen to as they cover people’s personal stories. Practice Portuguese is for people who are doing well reading Portuguese but need help hearing it. The speaker goes at a slow pace and speaks very clearly. Camões Instituto da Cooperação e da Lingua Portugal is funded by the government of Portugal. This website offers a huge amount of material for learning every part of the Portuguese language. It includes books (which include audio) that cover history, biographies, poems, and more. They also offer a Portuguese reference guide so that you can handle everyday situations in this language. Recontando is a Brazilian news website that is designed for children. The news is told in simplified sentences and the content is suitable for all ages. They sometimes have children on who interview celebrities. NHK World Radio Japão is a radio station that covers the world’s news. They speak at full speed, but clearly. Watch this in the morning and then afterward look the stories up to see how well you understood them. Cinem(ação) is a podcast that covers movies and entertainment news. The show airs weekly and has great hosts who keep things lively and interesting. When you’re at this level you can listen and watch the same media as native speakers. There is a lot of podcasts, videos, and other media with these being among the best. Conta-me Tudo, or Tell Me Everything, is a really fun podcast. Each episode features a guest who shares their personal story with the audience. There is a huge variety of topics that are covered which includes weird ways to start a career, ways someone almost died, and the worst birthday present they ever received. Everyone speaks at their normal fast pace so it is a great resource for advanced learners. CBTV Canal Brasil is a show that can be watched on Apple and Android mobile devices as well as on a Roku box. It is a free and live TV channel that is designed for Brazilians who have moved to the United States. This show films in Florida and covers topics of interest to expat Brazilians such as news, sports, entertainment, health news, and pets. As the content is designed for native Brazilian Portuguese speakers the content on this TV channel is great for advanced learners. These resources will show you how to learn Portuguese language. Portuguese is a great language to learn and will come very much in handy if you ever decide to visit Portugal or Brazil. Around 260 million people speak a Portuguese dialect making it the sixth most spoken language in the world. When it comes to Romance languages it is the second most spoken language falling only behind Spanish which is spoken by about 440 million people natively. If you are dedicated to learning this language you can take it to a fluent level inside of six months. It is a bit more difficult than Spanish due to a more complex sound inventory but is still familiar enough to native English speakers that they shouldn’t have too much difficulty mastering this language. The important part is to practice Portuguese as often as possible, making it a daily habit even. By reading and pronouncing the words you will learn how to correctly pronounce them so that you can communicate clearly with others in this language. Learning Portuguese also makes it much easier to learn about the fascinating histories and cultures of both Portugal and Brazil.